Benson (population 408) is located in upper-central Illinois in the northeastern portion of Woodford County. Illinois Route 116 is the main roadway through town and connnects it to Interstate Highway 39 four and a half miles to the east. The At & St Railroad travel though Benson as well. A larger metropolis near Benson would be Peoria, about 20 miles to the west-southwest of Benson. The history of the town and its' school system is in need of updating and research by a local resident of fan. Benson probably offered a school program for its children by the late 1800's. A high school was probably in place by the late 1800's & certainly by the early 1900s. Benson High School served the town's residents, and was a source of great pride, for many years. The mid-1950's saw a change in the making. The neighboring towns of Roanoke and Benson began consolidation talks. This effort became a reality in 1956 with the creation of the Roanoke-Benson School District. 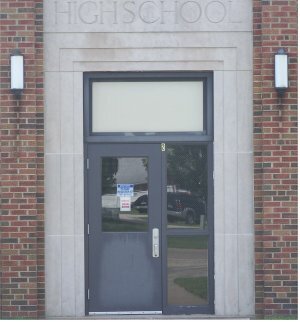 "The old high school in town is now the Roanoke-Benson Junior High School. The elementary school for Roanoke-Benson is located in Roanoke and it is called Sowers Elementary. However, there was a previous Benson K-12 school that was located where the village park is now. When the "new" high school was built (around mid-century) the old high school became an elementary/middle school. That old school has been torn down, the only thing left of it is a concrete sign." The high school for the R-B system was located in Roanoke. The grade school was, and still is, located in Benson. 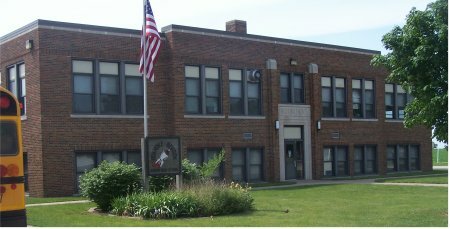 We believe classes are held in the original Benson High School building. Benson HS team nickname: the "Broncos"
Benson High School competed in boys basketball for sure as a member of the Tri-County Conference. We believe that baseball and track were also offered at the school. Team uniform colors, fight song, and conference affiliation are being sought. We are told that Benson and Roanoke were huge rivals in basketball. Teams from the area that Benson played year-in and year-out included Minonk, Wenona, El Paso, Eureka, Low Point, Washburn, LaRose, Rutland, Flanagan, and Toluca. There is a nice listing of seasons that Benson High competed in basketball on the IHSA website (www.ihsa.org). If you have any further information to add to what is listed below, please forward it to us so we can share it on the site. As you can see, the coach's names of the late 1940's, which were extremely successful, are not currently available. In the school's final season, the Broncos beat Roanoke to win the prestigious Tri-County Conference Tournament, 70-66. 1948-49 21- 6 Nice Record! 1949-50 27- 2 District Champions! !